I love Scripture’s account of when Jesus healed a paralyzed man. Those of us who grew up in Sunday school know it well. If you are new to faith or just getting to know the Bible, I am confident you are going to love it too. Nestled into Luke 5, we see a group of guys who had a loved one that was paralyzed. They loved their friend and wanted him to be well. Having heard that Jesus was in their town and knowing of the power He possessed, they sprung into action. “Some men came carrying a paralyzed man on a mat and tried to take him into the house to lay him before Jesus” (Luke 5:18). They took him to Jesus. “When they could not find a way to do this because of the crowd, they went up on the roof and lowered him on his mat through the tiles into the middle of the crowd, right in front of Jesus” (Luke 5:19). Can you even imagine? Can you imagine the thoughts of the people inside the house as they began to see the ceiling tiles moved? And then to see a man lowered through the roof into the middle of the crowded Jesus-lesson!? My. Glory. Theses guys were intentional. They were on a mission. They positioned their friend in the presence of the Healer. And their belief in the power of Jesus was visible to His divine eyes. “When Jesus saw their faith, he said, ‘Friend, your sins are forgiven’” (Luke 5: 20). Jesus saw their faith, which was active, and He began His work of healing from the inside out. He started with this man’s heart. Healing always begins in the heart. People were ruffled. Eyebrows were raised. Anger flared. Chatter began in the minds of the religious leaders in the crowd. Then the radical Jesus-show continued like this. Jesus knew what they were thinking and asked, “Why are you thinking these things in your hearts? Which is easier: to say, “Your sins are forgiven,” or to say, “Get up and walk”? But I want you to know that the Son of Man has authority on earth to forgive sins.’” So he said to the paralyzed man, “I tell you, get up, take your mat and go home.” Immediately he stood up in front of them, took what he had been lying on and went home praising God. Everyone was amazed and gave praise to God. They were filled with awe and said, “We have seen remarkable things today”(Luke 5:21-26). Do you not just LOVE this story? So many practical faith lessons stick out to me. If we apply these to our lives, I believe these initiatives will help us and help others find healing in Jesus. Check it out. #1. Take the hurting to Jesus. Pray. Encourage. Be available. Speak life. #2. Have faith in God’s ability to heal and move powerfully. I cannot take my friends to Jesus physically but I can grab their mats as I hit my knees. I can pray with them and for them. I can encourage them toward believing God for big things. I can walk them to the healing and grace of Christ. Time and time again in Scripture God rewards persistence. I must be persistent in my mat carrying. #4. Remember that healing begins with Jesus… and in the heart. Jesus dealt with the sin sickness first then He addressed the physical needs. Must. Remember. This. When I pray for my loved ones, I will pray for their hearts first. A simple but vital truth. No matter how big or small, confess it all. And trust Him to hear and heal your heart. #6. When Jesus tells you to get up, GET UP. Get off your mat! Don’t linger in the lame. I see woman after woman paralyzed by her past, by failures, by limitations, doubts, and circumstances. This is not God’s plan for anyone who has placed her faith in Christ. God is full of strength, wisdom, mercy and love. We have full access to all of it. When I ask for forgiveness, I must believe that my sins are covered. When I ask God for healing, or wisdom, or provision, or strength, or peace, I have to move beyond the paralysis of my problem to the power of His all-sufficient grace. Lord Jesus, Thank You for being a Friend to the broken and the Healer of hearts. Help me to move beyond my paralysis into the freedom, strength, and healing you have for me today. Teach me truths in the trials and empower me to believe beyond my doubt. What beds of brokenness have you been lying on? Got any spiritually or emotionally paralyzed friends who need you to carry their mats? What one thing could you do today to get her/them to Jesus? Will you do it? I would love to hear about it. CLICK HEREto visit my blog and share your thoughts in the comments section. 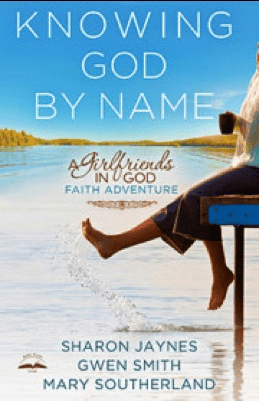 purchase the Girlfriends in God book, Knowing God by Name. ONLY from the store at GwenSmith.net.